Hello, my name is Lily Henne and at home, I have two lovable little dogs and, in my opinion, an adorable bearded dragon. I couldn't even begin to imagine if my pets didn't have a home, food, or love. Sadly, there are some animals that need attention and care. Luckily, the South Lake Animal League rescues about 100 animals every month. Obviously, to take care of lots of animals you would need an abundance of supplies to keep them healthy. Therefore, I have organized a Pet Supply and Food Drive to help the animals in need. I am interested in helping this organization because I have always loved all animals and can't bear to see them sad, sickly, and homeless. 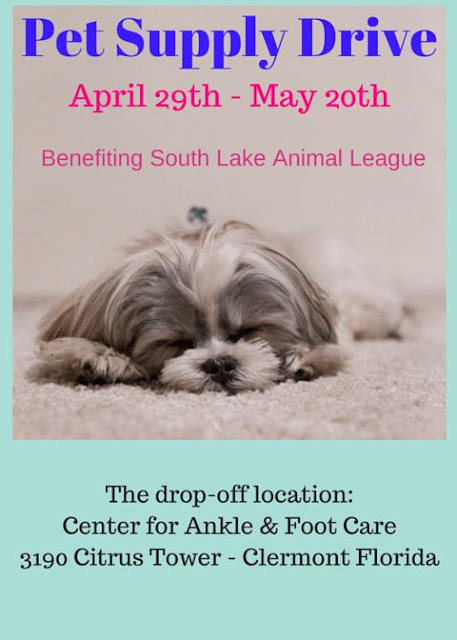 The Pet Supply and Food Drive will be April 29th - May 20th. The drop off location for the supplies is the Center for Ankle and Foot Care. The address is 3190 Citrus Tower - Clermont Florida. The Center for Ankle and Foot Care will be open for drop offs from 8 AM - 4 PM on Monday through Thursday. On Fridays, it is open from 8 AM - 1 PM. I will try to get other drop off locations for the drive. If I get another location I will update my blog. Blankets that fit in a washer. Hand Handled Scrub Brushes and Trash Bags; 14 gallon, 33+ gallon, 55 gallon. 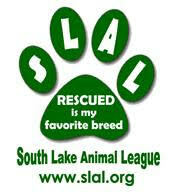 To conclude, I think that everyone should support the South Lake Animal League, an amazing organization. One great way is to simply donate some pet supplies and food. For as little as 3 dollars you could make a cat or dog very happy. How would you feel if you were without care, food, and a home?